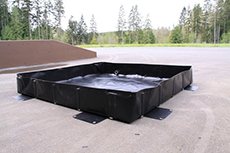 Spill Containment Berms, Water Bladders & Fuel Bladders @ Intersate Products Inc and pallets help our clients store and comply with EPA regulations. Interstate Products Safety and Flammable Cabinets available from the industry leaders. Interstate offers the best in environmental, storage, safety and facility products. Since 1996, Interstate Products, Inc. (IPI) has been providing innovative maintenance, environmental and safety product solutions to industrial, commercial and governmental facilities. Interstate Products business has experienced tremendous growth as we continue to add new products and services to meet the demands of a rapidly expanding customer base. Interstate Products is very proud to have been selected as the supplier of choice by thousands of businesses including manufacturing operations, utility company, farms, refineries, construction sites, fire departments, relief agencies, energy management, engineering firms, airports, marine fleets, disaster relief, power compnies and HazMat teams around the globe. Intersate Products has provided unsurpassed service since 1996 and is a leader in the spill control, contaiment and faciity product industry as well as water and fuel bladders. Buy Brands You Can trust at Intersate Products Inc.
Interstate Products offers thousands of brand name environmental, bladders and safety products. We are always looking for new product suggestions to serve our customers better and invite you to contact us any time to submit your product ideas. We are also an industry leading provider of high quality cabinets, pallets, storm water solutions, coatings, spill containment berms and other spill products and flexible storage tanks. These highly specialized products are available in standard sizes and can be fabricated for custom applications. For additional information regarding these products, please contact our product specialists.